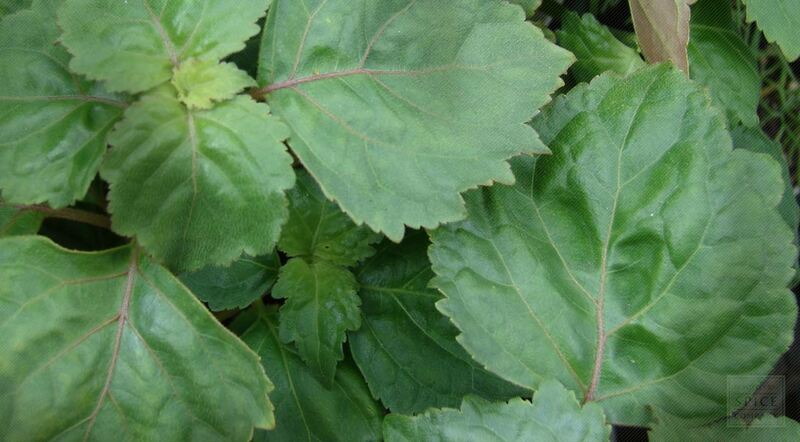 Patchouli is a shrub-like plant in the mint family native to southeast Asia. The leaves of the plant exudes a sweet, exotic, earthy scent when rubbed or bruised. The dried herb lends a musky fragrance to potpourri, and also acts as a fixative to “fix” the scent of other ingredients. Combined with essential oils and botanical resins, dried patchouli is transformed into incense that can be burned over smoldering charcoal. Dried patchouli is also helpful to have on hand if you have pets, especially during warm weather months when fleas tend to hitch a ride indoors on your pet’s fur. A dusting of the finely ground or powdered herb on pet’s bedding and other places where fleas may lay eggs acts as a natural barrier. Pogostemon cablin is a species of plant from the Lamiaceae family. This is a fragrant herb, with soft, opposite, egg-shaped leaves and square stems. It can reach from 2 to 3 feet in height, giving out the peculiar, characteristic odor of patchouli when rubbed. Its whitish flowers, tinged with purple, grow in both axillary and terminal spikes. The crop is cut two or three times a year, the leaves being dried and packed in bales and exported for distillation of the oil. Patchouli has a strong heavy scent, especially when distilled into an oil form. The best oil is freshly distilled near the plantations. That obtained from leaves imported into Europe, often damaged and adulterated even up to 80 per cent, is lesser quality. The name patchouli is from the native name for the plant in Madras, said to be from Tamil pachchai "green" + ilai "leaf”. Patchouli is native to tropical regions of Asia, and is now extensively cultivated in China, Indonesia, India, Malaysia, Mauritius,Taiwan, the Philippines, Thailand, and Vietnam, as well as West Africa. Patchouli grows well in warm to tropical climates. It thrives in hot weather, but not direct sunlight. If the plant withers due to lack of water, it will recover well and quickly after rain, or watering. Does best in a rich, fertile soil that is consistently moist. Propagate by dividing rhizomes, tubers, corms or bulbs (including offsets), or by softwood cuttings. The tiny seeds may be harvested for planting, but they are very delicate and easily crushed. Patchouli leaves may be harvested several times a year, and then dried for later use or for distillation into patchouli oil. Store dried patchouli leaves in an airtight container in a cool, dry place. Patchouli has long been brushed off because of its association with the hippie culture of the sixties. However, patchouli remains a valuable part of today’s herbal medicine. It has many functions that you may find useful today. And it has a rich history that gives it character. 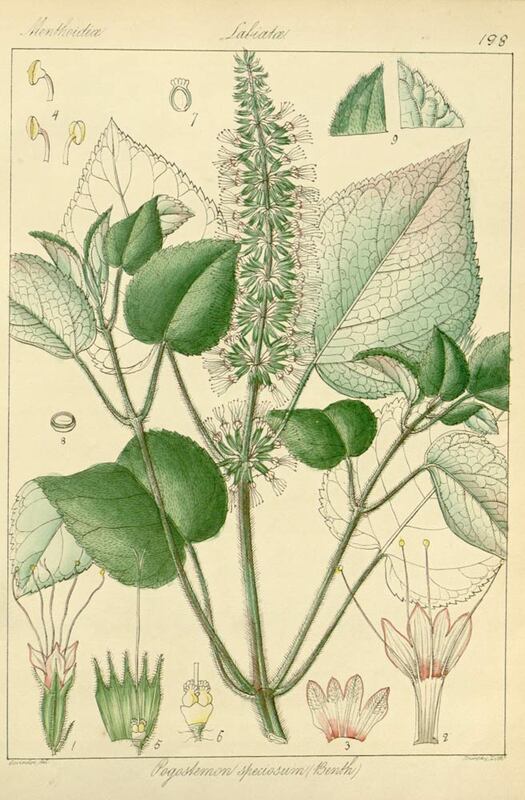 The patchouli plant is native to India and China. It’s now cultivated all over the world, though. At one time, it was used for many purposes in the East. The oil has been used as a bug repellent, a treatment for headaches, and even used to treat tumors. While it’s no longer used to treat serious illnesses such as cancer, it is used for several health conditions. Patchouli is most often used today in aromatherapy. Few people who smell the luxurious scent of patchouli would disagree that it is an inviting aroma. It can be used to treat problems such as fatigue, stress, constipation, and it can also be used to help suppress the appetite. And it will come as no surprise to many that patchouli is also an aphrodisiac. Patchouli is also used as a fragrance in colognes and perfumes. Many hair and skin products also contain the herb. In addition to using it for its delicious scent, patchouli also has health benefits for the skin. If you’re suffering from eczema, dermatitis, or acne patchouli oil can be a great benefit. When applied to affected areas it can be soothing and help to relieve problems. In addition it can be used to treat minor scrapes and skin irritations. If you have athlete’s foot, patchouli is an antifungal that will help to treat the infection. Patchouli is also, strangely enough, a flavoring for some foods and drinks. In studies done in India, patchouli was shown to work against many fungal infections and even fight many bacterial strains. That’s probably why it works so well at treating skin infections and irritations. And if you want to avoid using commercial insect repellants, patchouli oil still works very well at fighting mosquitoes that cause problems such as malaria and West Nile virus. Applying the oil to your skin every two hours should keep you free from the little bloodsucking insects. Patchouli is a good herb to have around to treat many different skin conditions. It’s also got uses in aromatherapy and cosmetics that make it a popular herb. While its popularity was at its peak during the hippy days, it’s still a modern treasure.